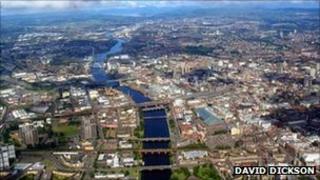 Glasgow is the UK's most-mentioned city in song titles, with Edinburgh coming in second, it has been claimed. A chart produced by PRS for Music - an association of composers, songwriters and music publishers - looked at 30 towns and cities, excluding London. Glasgow was top with 119, followed by Edinburgh on 95, Birmingham on 89, Liverpool on 67 and Manchester on 63. Belfast was sixth on 60, followed by York on 59, Brighton on 54, Bristol on 49 and Newcastle on 31. Guy Fletcher, chairman of PRS for Music said: "Songwriters feed off their inspiration and this could be anything from a feeling or an object or place. "It seems that a number of songwriters have taken Glasgow into their hearts and felt it was right to produce a piece of work about their feelings towards the city. "It's great to see two Scottish cities, both Glasgow and Edinburgh, having such an effect on our members."